Planning Center Data Integration, Now Available! 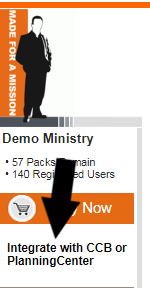 Planning Center Online is a very popular Church Management Solution (ChMS). This popularity is due to its low cost and modular options. As a result, AssessME.org now offers an optional data integration with Planning Center. Please review the screenshot below to see how our data displays within the Planning Center Online software. As the screenshot shows, our data integration includes a Profile “jump-link“. This link enables church staff to view the entire Candidate Report within the AssessME.org program. Our Planning Center Data Integration is an option you can turn-on within your church’s admin account. There is a one-time setup fee of $99.00. To proceed, simply log into your church’s AssessME.org administration account to purchase this integration (See Graphic Below). Then, after completing a simple setup process (Setup Instructions), the integration program will run invisibly behind both AssessME.org and Planning Center Online programs.